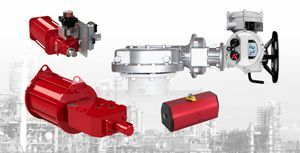 Rotork has received major contracts to supply electric and pneumatic valve actuators and valve gearboxes to Hengli Petrochemical (Dalian) Refinery Co. Ltd. for flow control in its new refinery and petrochemicals complex, one of the largest in China, at Changxing Island in Dalian City. The latest contract involves approximately 2,000 explosionproof electric actuators to operate gate valves and ball valves in tank farms. All these units are Rotork IQ non-intrusive intelligent multi-turn actuators with double-sealed IP68 watertight protection for enhanced reliability, an important consideration in the site’s saline ambient environment. In addition to providing optimum reliability, the IQ actuator is also designed for advanced functionality, particularly in those areas associated with predictive maintenance and asset management. IQ actuator dataloggers record detailed operating data including valve torque profiles, the number of valve operations and alarms. The ability to download and analyse this information can make a vital contribution to effective long-term asset management of the refinery. The IQ actuators are combined with Rotork Gears IB multi-turn and IW quarter-turn secondary gearboxes to meet the operating demands of the wide range of valve sizes and types. Pneumatic actuators orders encompass Rotork CP, GP and RC ranges of scotch yoke designs for quarter-turn valves. The combination of these ranges facilitates the direct-drive actuation of valves of virtually any size. The ability to deliver complete electric and fluid power solutions, with local manufacturing and service support in China, enables Rotork to provide a single source for flow control on the project. Find out more about the IQ.